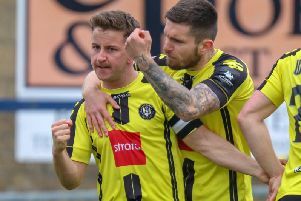 Harrogate Town welcome Tamworth to the CNG on Saturday afternoon looking to maintain their run of three straight victories. Tamworth will be no easy task for Town, however, as Saturday’s visitors have started the season unbeaten, winning one and drawing one, something will have to give on Saturday. Tamworth’s six goals this season have been shared equally between Elliot Durrell and Shane Clarke with the latter’s brace securing Tamworth’s most recent win over AFC Telford. Victories over North Ferriby United, Worcester City and a point at FC United of Manchester see Tamworth on ten points, a point and a place above Town in the National League North. Simon Weaver will be looking to his back four to stifle the prominent duo, while hoping new signings Dominic Knowles and Brendan Daniels can continue their hot streak in front of goal at the other end. Like Clarke and Durrell, Knowles and Daniels have three goals a piece and are full of confidence going into Saturday’s crunch clash. Harrogate Railway, meanwhile, face two fixtures in three days as they travel to Brighouse Town on Saturday before welcoming Scarborough Athletic to Station View on Monday night. Consecutive draws against favourites Droylsden and Spennymoor Town have given manager Lee Ashforth plenty of reasons to be cheerful ahead of a busy next few days. Having secured promotion the year before, Brighouse finished 14th in their first season in the Evo-Stik NPL Division One, although couldn’t prevent a rampant Railway triumphing 4-1 at St. Giles Road last December. So far this campaign, Paul Quinn’s men have secured a point at much-fancied Trafford, with James Pollard and Ernest Boafo’s goals mounting a second half comeback, although Steven Hollingworth’s strike wasn’t enough to prevent a 2-1 defeat at home to Ossett Town. Scarborough welcome Trafford on Saturday before making the journey to Station View on Monday night, where they will be looking to continue their perfect start to the season. Tadcaster Albion will be firm favourites in Saturday’s clash with Brigg Town after a 5-0 demolition of Athersley Recreation on Wednesday. Billy Miller’s men are the league’s top scorers by far, having notched 14 goals in their opening three fixtures and will be looking to add to that tally against recently relegated Brigg. Saturday’s i2i visitors haven’t fared much better in the Toolstation NCEL Premier Division, losing all three opening games and lingering at the bottom of the table. Elsewhere, Knaresborough Town will be getting used to life without captain Matt Duerden following Tuesday night’s triple arm break, as they visit Winterton Rangers. Things have been going well on the pitch for Paul Stansfield’s men as back-to-back victories against Dronfield Town and Westella VIP have propelled Town up to 6th. Coming up against a defence that has shipped 11 goals in their last two outings, Town fans will be optimistic of securing a third straight success. Finally, in the West Yorkshire League, Boroughbridge will be full of confidence after their derby demolition of Ripon and travel to Thornhill in Saturday’s outstanding fixture. Ripon host Stanley United looking to bounce back, while, in the top tier, Bardsey are away at Leeds City, Wetherby host Carlton Athletic and Knaresborough reserves entertain Beeston St Anthony’s.